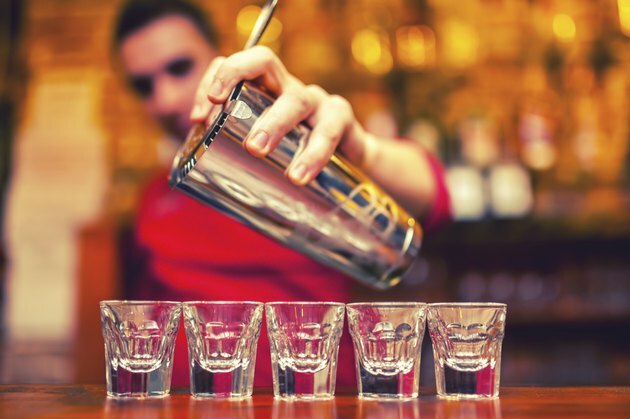 How Many Calories Are in a Shot of Triple Sec? You may enjoy the taste of Triple Sec or you may use it in a mixed drink such as a margarita. This liqueur has more calories in it than does a shot of regular liquor, even though Triple Sec packs less of an alcohol punch. A 1.5-oz. shot of liqueur such as Triple Sec has about 188 calories. In contrast, the same size serving of tequila, vodka or other hard alcohol has about 98 calories. Liqueurs have a higher amount of sugar in them than do other types of alcohol such as wine, beer or regular liquor. Triple Sec has almost 11g of sugar per ounce. Hard alcohol does not generally have sugar in it. Triple Sec has less alcohol by volume than hard liquor. It is 60-proof, meaning it is 30 percent alcohol by volume. Hard liquor often is 80-proof, or 40 percent alcohol by volume. How Many Calories Are in Brandy Alcohol? How Many Calories Does a Shot of Bourbon Have?